Despite being completely caught off-guard by a weather report that was a bit wide off the mark, Stephen Ainsworth’s Loki, with Gordon Maguire at its helm, was successful in winning the line and handicap double in the Cruising Yacht Club of Australia’s Flinders Islet race today, missing the race record by just over one hour. “It makes up for our Hobart result (47th overall),” quipped Maguire, after the Reichel/Pugh 63 took line honours in the 92 nautical mile race at 05.33.47 this morning. Loki finished just under one hour ahead of Geoff Ross’s Reichel/Pugh 55 Yendys; it was enough to collect overall victory over Yendys. Loki’s finish time of nine hours 33m 47s came tantalisingly close to the 8 hours 30m 29s record set in 2006 by CYCA Commodore Matt Allen and his Jones 70 Ichi Ban - and a few more sails in Loki’s on board wardrobe could have made the difference. Maguire, who is in charge of Loki in Ainsworth’s absence, said he and the crew were thrown by a strong southerly change that made its presence felt shortly after last evening’s 8.00pm start. The Bureau of Meteorology had predicted 13-18 knot north-nor-easterly winds followed by a southerly change of up to 20 knots on Saturday morning. “It ambushed us. We were sailing in a 9-10 knot north-easterly, but within an hour of leaving Sydney Heads we were hit by a fairly hard southerly around 24 knots; it peaked at around 32 knots in the rain squalls,” Maguire said. “I turned up with a light jacket and a pair of tennis shoes and we had light and medium jibs; we weren’t set up for the weather we got. All that aside; early this morning Maguire, who calls Sydney home these days, said he felt the crew had sailed well. “We did sail well and I have a good feeling about the results.” His feelings were right. 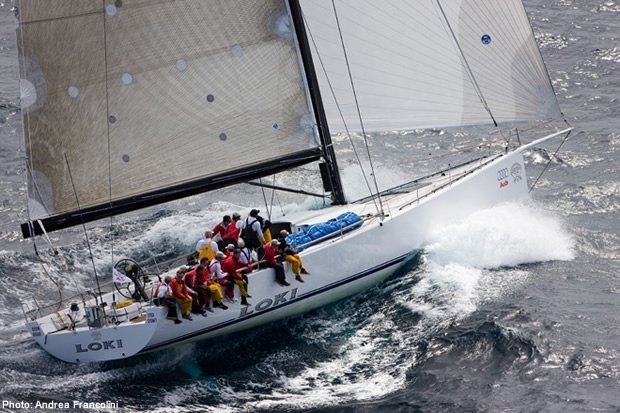 The two TP52’s, Syd Fischer’s Ragamuffin and Bob Steel’s Quest, followed Loki and Yendys over the line. The top four, all from the CYCA, finished in the same order overall. Ross, from Sydney, said he was surprised when the breeze changed so quickly. “The Blue Water Pointscore is well named – it was a real blue water race - we saw 35 knots at one stage. I haven’t done the Blue Water Pointscore for a while; it’s a good series. The CYCA yachtsman predicted the outcome of this race in relation to the BWPS would be an interesting scenario: “It’s going to come right down to the final race in March. I think the points will be even more compacted at the end of this race,” was his synopsis. He was right on the money and the final race will be a thriller. Six points separate the top six following this race. Ragamuffin has taken the overall lead of the BWPS on 15 points, one point ahead of Quest (16), with AFR Midnight Rambler (Ed Psaltis and Bob Thomas) which was at the top of the leaderboard coming into to the race, now third placed (17) after finishing fifth overall today. Behind them are Yendys (18), Loki (19) and Anthony Paterson’s Ker 11.3 Tow Truck (21), from Lake Macquarie. In the Tasman Series (PHS category), AFR Midnight Rambler looks to have the Series stitched up, 11 points ahead of nearest adversaries, Steven Proud’s Sydney 38 Swish and Tow Truck, which are on an equal 30 points. Still in the mix are Andrew Wenham’s SES Inch by Winch (38 points) and Yendys (39). The last and defining race of the Blue Water Point Score and the Tasman Series for the PHS trophy is the Audi Sydney Offshore Newcastle Yacht Race, starting on March 19, which will decide the winners of both trophies. Should Syd Fischer win it again, it will be a record 10th BWPS triumph for the decorated veteran who will turn 83 in early March. From the 16 that started the race last evening at 8.00pm, three yachts representing the CYCA retired from the race; Copernicus (Greg Zyner) and Zora 1 (Phillip King) reporting gear failure, while Tony Kirby’s Patrice SiX limped home this morning with a torn mainsail. The last boat home was SES Inch by Winch, which crossed the finish line at 2.27.09 this afternoon.